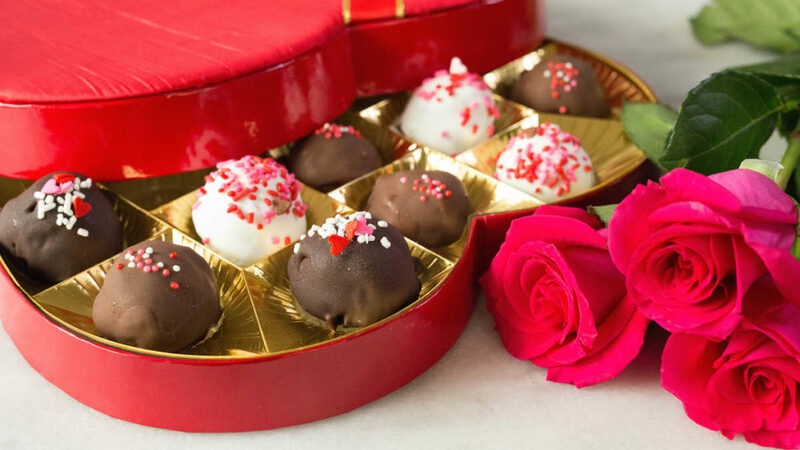 Tired of handing your significant other a boring box of chocolates on Valentines Day?! Do you instead want to impress and really knock their socks off?! Boy, do I have a recipe for you! With Valentine’s day right around the corner, I knew it was a perfect opportunity to create my own version of those truffles. I decided to go with gelato instead of regular ol’ ice cream. Not only because I’ve been making a lot of gelatos lately, but because when I think of truffles I think of how soft, airy, and smooth the insides are. I was also afraid if I used ice cream, the texture might be too hard. We all know how messy eating ice cream and gelato can be so I made these truffles bite-sized. Just pop them in your mouth, one at a time (or more, no one’s judging…), with no chance of any melted gelato running down your arm. To make the truffle shell, I had to dip these truffles into homemade magic shell chocolates of different varieties. I wasn’t aware of how easy it is to make your own magic shell, but I’m glad I found out! 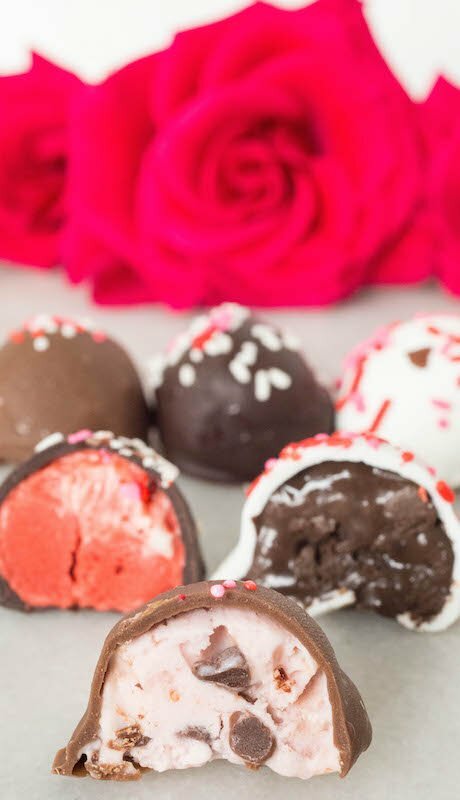 Once you have your gelatos made, these really are one of the easiest treats to create and I promise you, not only will your significant other be blown away by your creativity, but they will also remember this Valentine’s Day as the day their life became better. In a medium saucepan, whisk together milk, heavy cream, powdered sugar, cornstarch, red velvet cake mix, and red velvet emulsion. Place saucepan over medium heat and whisk constantly for 7-10min or until mixture bubbles and thickens. Strain mixture through a fine sieve. Cover surface with plastic wrap and refrigerate for 1 1/2 to 2 hours or until completely cool. While gelato mixture is cooling, prepare the cream cheese icing. In a mixer, mix together the butter, cream cheese, and vanilla. Add in powdered sugar, a 1/2 cup at a time, until mixture becomes creamy. Once gelato mixture is completely cool, pour into an ice cream maker and churn for 10 min (This is less than what you would do to churn ice cream). Scrape half of the gelato mixture into a freezer safe container. Top with half of the icing and use a knife to loosely swirl. Top with the remaining gelato and the rest of the icing and swirl one last time. With a mini ice cream scoop, scoop out 8 balls of each flavored gelato onto a parchment paper lined baking sheet. Put into the freezer for 3o min. While gelato scoops are freezing, melt each flavor of chocolates separately with 2 tbsp of coconut oil in the microwave (I melted the chocolate in 30-second increments until completely smooth to avoid burning the chocolate). Once the chocolates are melted and the gelato has been frozen for 30 min, dunk each gelato ball in their corresponding chocolate shell. I dipped the raspberry dark chocolate gelato in white chocolate, the strawberry mini chocolate chip gelato in the milk chocolate, and the cream cheese swirl red velvet gelato in the dark chocolate. 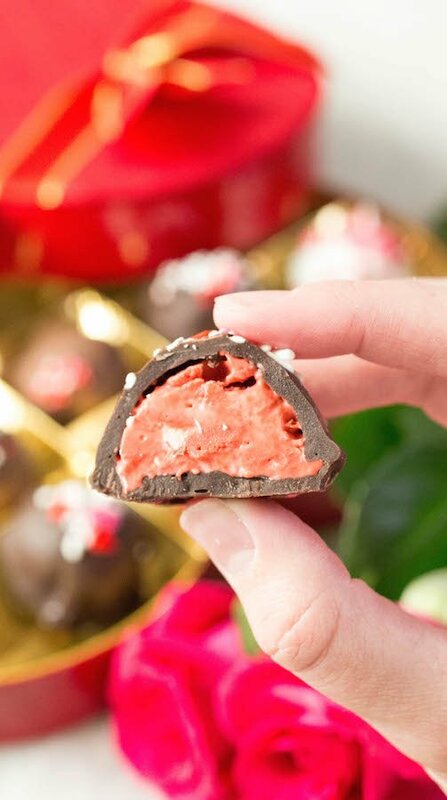 Moving quickly, before each chocolate shell hardens (should harden within 30 seconds), sprinkle on a bit of Valentines sprinkles. Once chocolate shells harden, serve immediately. You can also freeze for future consumption. If frozen, I would set out for 5-10min before eating again to let gelato soften.